I must admit that I was slightly disappointed with this coloring book. As by someone who enjoys coloring and crocheting, I was hoping for something more (especially based on the title.) I own several other coloring books by artist Jessica Mazurkiewic and this is the first that I haven’t liked more than average. The problem, for me, is the title. It is called Calming Crochet. For me, calming crochet is a meditative state that I enter as I am crocheting. At worst, it is the feeling I get when I have finished a project. What this coloring book portrays is stereotypical images of crocheters and their projects. There are granny squares and hipsters and odd little projects. Frankly, in order for the title to match the content, I would have wanted a title something along the lines of “Odd, out of date trendy, crochet”. 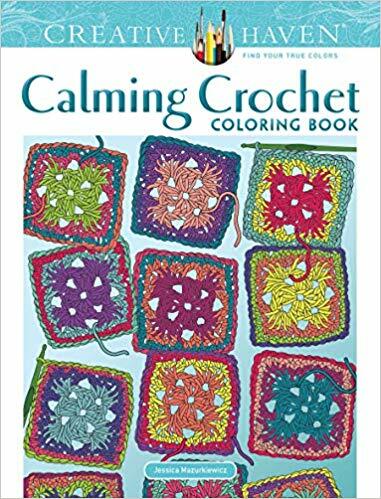 Having said all of that, the designs themselves are well done and, if you like this style of crochet or want to give a gag gift to someone who crochets and colors, this one might be a book that you would like. It’s just not really what I wanted or expected but it is what it is. I’ll find a home for my copy with someone who will appreciate it for what it is. I’ve noticed that the paper quality seems to change quite frequently on the Creative Haven line. Because of that, if you buy one of these books, it may be slightly smooth or slightly rough depending on when and where it was printed. I’ve found that coloring medium, including pencils, work similarly with both slightly rough and slightly smooth paper from Creative Haven. In this case, my coloring book pages are slightly rough. 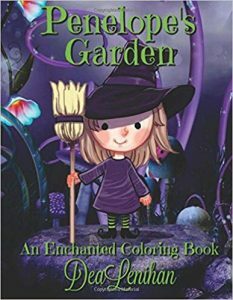 This is a slightly older coloring book (originally published in 2016), so I was very surprised to find that there were only 15 unique coloring designs in the book while the product blurb mentions 16. If it was originally a mistake, one would have thought it would be corrected by now. Because of this and the lack of a framing line at the outer edges, I reduced my rating by a star. I suggest that the artist take the opportunity now to either correct the book or the description. The designs are cute and are of a little witchy style girl. She is shown in a number of poses along with the flora and fauna that inhabit her garden. While you get 15 unique designs (including one which is more of a tag style page), you get two copies of each for a total of 30 coloring pages. The designs are detailed and have a great hand-drawn, sketch like quality to them. Because of that, the lines can be thin/thick or light/dark depending on how the artist was coloring that day. 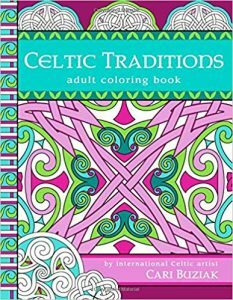 This is an outstanding coloring book inspired by Celtic designs. Cari Buziak has several other Celtic style coloring books available (from other publishers) but this is the first that I am aware of from CreateSpace (i.e., self-published.) I can look beyond the less than steller quality of the paper to the sheer number of designs (50) and the beautifully wrought artwork. The designs range from extremely traditional knots to designs with animal motifs. Some of these are quite traditional and some are surprisingly fun (I especially like the cat chasing the mouse design.) There are square designs and round ones and also some that include coat of arms. The designs are detailed and some are intricate and more of a challenge to color. There are designs for all levels of colorists to enjoy. That is what is so great about getting 50 designs – there is something for everyone. You can also advance as your skills improve. 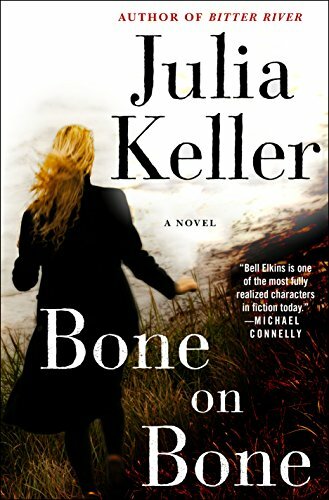 This the second book in this series and the first that I have read. I didn’t have problems picking up the story line so it can be read stand-alone. There were numerous references to the first book but not so many that it would make reading it a chore. There is a past to the characters that could be enhanced by reading the first book, so if you have the chance, you might read the series in order. There are 20 designs in this book. The female characters all have a similar look (very, very thin with slightly oversize heads and large features.) The result is rather an elfin type look than an emaciated “Twiggy” look. It is definitely grayscale, so be aware that there is a use of light gray on each design. Grayscale is a type of coloring which calls for coloring over gray to get shading rather than simply coloring each element on its own. I used to use markers with pencil over top but as my health issues no longer allow me to use markers, I use pencils by themselves. A different look and feel but fun nonetheless. 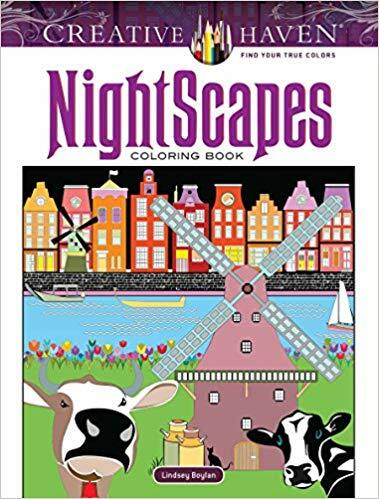 This is an older coloring book by Dover. The copyright date is 2001 but has a statement that it was manufactured in 2016. I assume that means that the paper is more like what we expect today versus what was available when it first came out. The designs are printed on both sides of the page with blurbs of information printed at the bottom of each page as well. This is consistent with what I expect from these older books. 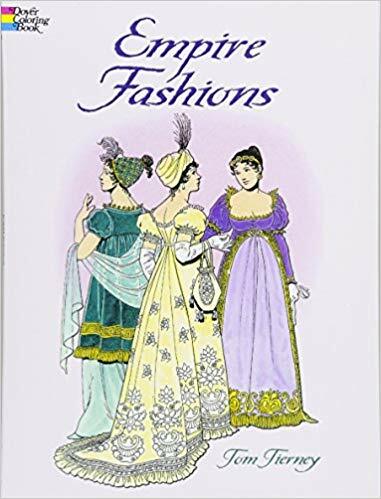 The designs are of both men’s and women’s fashions and are based on French fashion of before and after the Revolution and of the clothing of the Napoleonic era. Not only did the Revolution have its effect on the political position of the world, it had a huge effect on the clothing people wore. With regards to women’s fashions, there was a slim down of the silhouette, lower necklines and much thinner (even translucent) fabrics used. You can see this fascinating change in this book and, if you are so inclined, color the fashions to suit your own imagination. The designs are well done and are detailed without being overly intricate. The fashion plates are as such without any form of background. 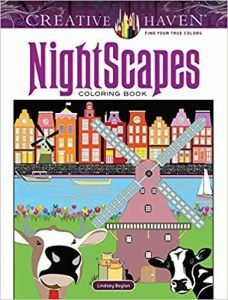 This is a coloring book of nighttime scenes from a wide variety of cities around the globe. While the scenes are quite cute and the concept is fun, the serious problem I have with this book is that the detail is too small. If you have vision or fine motor skill issues, I would definitely not suggest this book for your use. 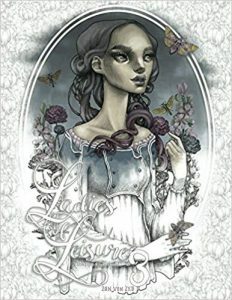 I own a number of coloring books by Lindsey Boylan and I appreciate her designs on black background. This time, I think it is merely okay. I personally would have preferred the ability to choose the time of day I wanted for my project. For some reason, I also feel that the designs show more of a computer generated feel this time. Perhaps I am wrong but that is what it looks and feels like to me. Having said all of that, I will enjoy coloring some of these designs. The ones that have high detail, I’ll leave to my husband or friends who have more patience than I have. The designs are cute and may be fun to color; they’re just not always my cup of tea. I would also have liked to have seen the name of the city on the reverse side of the page or, at the very least, a listing on a page at the beginning or end of the book. 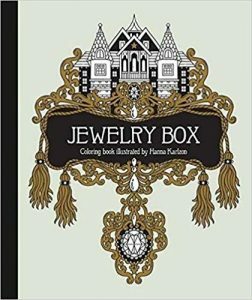 This is the latest coloring book by Hanna Karlzon. The designs are exactly what you expect from this artist. In her signature style, there are designs of birds, flowers, cats, mice, gems and lovely ladies with lots of jewelry and artwork on their skin. The designs are detailed and have intricate and small areas to color. 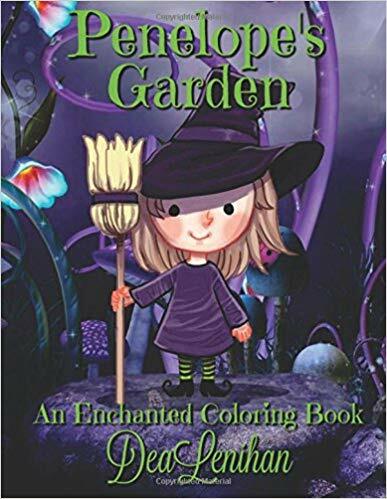 The designs are lovely, imaginative and, most of all, fun to color. 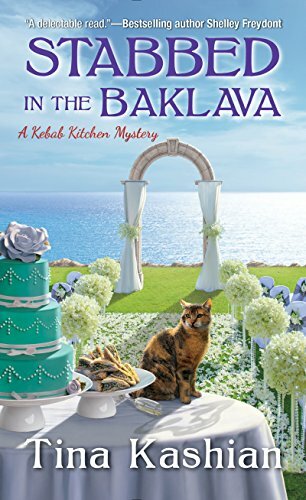 This is the eighth book in the Bell Elkins mystery series though it is the first one I’ve read. I was able to easily pick up the thread of the plot, understand the characters and get a sense of their past interactions. The book is easily read as a stand-alone but has convinced me to go back and read the series. I want to know how things got to this point and how the characters evolved over time. This story picks up when Bell Elkins is released from prison. She is no longer able to practice law and has found a cause to champion. It seems Bell is the type of person who is driven and, since she is no longer a lawyer who can bring suit against wrongdoers, she is looking for another way. The drug trade has grown in her small town during the three years she has been away. There is a murder that seems connected to the trade and the now sheriff and prosector are busy trying to solve the crime. With each coloring book Hannah Lynn releases, I enjoy her work more and more. One would think she might run out of ideas but each, it seems to me, that her designs get better and more interesting all the time. That’s not to say her earlier books aren’t great but the new themes really appeal to me. 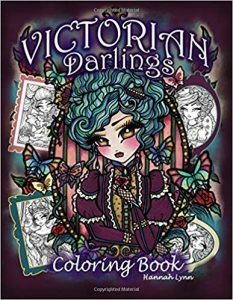 This coloring book is focused on Victorian young ladies. We see Ms. Lynn’s signature big eyed girls (with great lashes and diminutive noses) garbed in gorgeous Victorian styles. I must admit I admire the fashion but would not want to wear them. I have enough troubles with breathing and the thought of being laced into a corset would send me running (okay, walking really slow with oxygen in tow) for the hills.